‘The Book of Eli’ is a very austere film. Austere in that it is set 30 years after a nuclear war, so cinematography, costumes, even the dialogue is post-apocalyptic minimalist. Even the normally brilliantly-over-the-top-when-playing-a-villain Gary Oldman, is somewhat restrained. There’s a few decent fight scenes, but for the most part this is a road film, mostly involving walking from somewhere in the middle of the USA to somewhere in the west of the USA. It’s Mad Max meets Clint Eastwood in his ‘Man with No Name’ phase. The film stars Denzel Washington, Gary Oldman, Mila Kunis, Jennifer Beals, Tom Waits, Frances de la Tour and Michael Gambon, and has two directors, the twins, Albert and Allen Hughes. The following are the special features on the DVD version of ‘The Book of Eli’, which was the format supplied for review. Eli’s Journey: a mini documentary, 17 minutes long, looking at the making of the film, and at the motivation of the main characters. There are interviews with the two directors (the Hughes brothers), visual effects supervisor, concept artist, set designer, executive producer, producer, screenwriter and stunt co-ordinator, plus the actors Denzel Washington, Mila Kunis, Gary Oldman and Jennifer Beals. Films often draw up images to help with the setting up shots, but for this production they had the concept artist draw up a complete graphic novel, that worked as a guide for the complete movie for all key production staff. The Book of Eli Soundtrack: 5 minutes long, an interview with one of the directors, Allan Hughes, and the composer. Not that interesting, breaking down some of the key scenes, and how the music evoked the images. Deleted Scenes: not many, 4 all up, running just over two minutes in total. Starting Over: 12 and a half minutes feature, with production staff, actors and academics talking about the meaning behind the movie, and of how people and society would live in a post-apocolyptic world. On the Blu-ray version, the special features mentioned above are included, plus the mini documentaries ‘Survival Guide Mode’, ‘Building Carnegie’s Town’, ‘The Motorcycle Brigade’, ‘The Lost Tales – Billy’. Additionally it has subtitles in English (UK), Spanish (Castilian), Portuguese (Portugal), Swedish, Danish, Norwegian and Finnish. Or listen to the film’s soundtrack in English, Spanish (Castilian), Catalan, all in 5.1 sound. 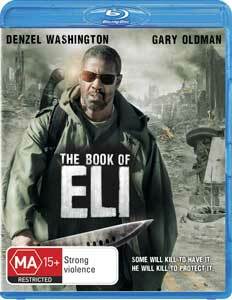 ‘The Book of Eli’ goes on sale tomorrow, August 18. It will be available on Blu-ray for $49.95 RRP, on DVD the RRP is $39.95. The film’s rating is MA15+.